Beetroot and horseradish bagels remind me of home and my mother’s beetroot, caraway and horseradish salad. There are bright, shiny mornings, when you wake up and smile to the perfectly blue sky and make plans for a long walk and a picnic in Hampstead Heath. And then, there is winter. With its cold, grey mornings, when the sofa seems to be your best friend. And bagels. You’ve got to be friends with your bagels. They have this thing about them that makes you get madly creative even in the most uninspiring times of the year. They would bear whatever you’ve got in your fridge, from plain cream cheese and herbs, up to the most hopeless leftovers. I love my bagels with some creamy scrambled eggs and plenty of chives, and often find myself unable to resist to the classic cream cheese and smoked salmon bagel. But this time I wanted something different, something to remind me of home and my mother’s beetroot salad with caraway seeds and horseradish. It is a simple and flavourful salad that my mother makes all year long. It’s a refreshing salad to be eaten cold in the summer and can make a great accompaniment to main courses during the winter. As a child I wasn’t very fond of it, but eventually I grew up to like it and now I find myself craving for it every once in a while. 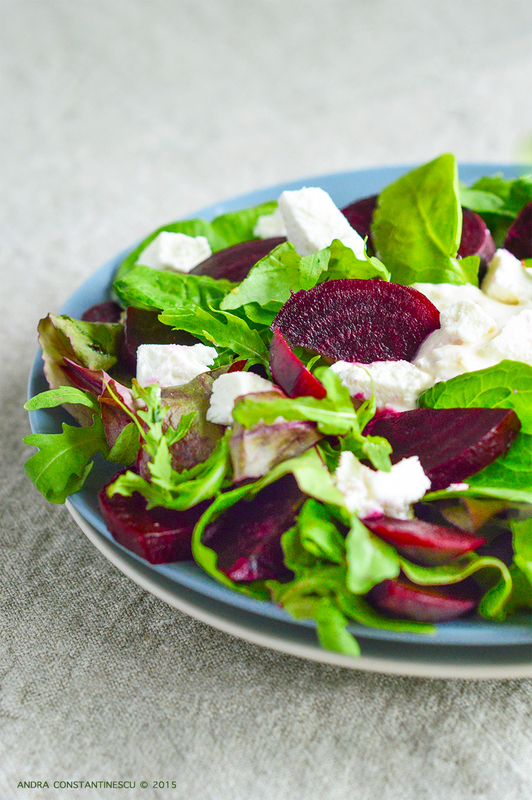 Beetroot is a great base for the nutty, fragrant caraway seeds and for the spicy, freshly grated horseradish that you can find in all farmers markets back in Romania. I’ve never came across to fresh horseradish here, but you can get some good horseradish cream or sauce from the supermarkets or ethnic shops. The beetroot and horseradish bagels recipe is quite simple: you can use either boiled or roasted beetroot and you can cook the beetroot in advance as it can be kept it in the fridge for a few days. Shop-bought cooked beetroot can also be a good alternative if you really want, but I do prefer cooking it myself. I rather like the roasted version, as is less messy, and I can also add some flavours to it while it’s baking, such as a splash of extra virgin olive oil, a spring of thyme, some caraway seeds and even garlic cloves. As for the horseradish sauce, you can find a few good ready-made varieties in the supermarkets. However, I prefer looking for plain grated horseradish and mix it with creme fraiche, salt and black pepper. Serve the bagels along with a handful of mixed salad leaves, or a combination of baby spinach and rocket. Alternatively, leave the bagels aside and make a refreshing salad with all the ingredients, doubling the quantities for the horseradish sauce. Place the unpeeled beetroot, caraway seeds, thyme and garlic in a roasting pan, coat with olive oil, add 50 ml of water and roast for 90 minutes, until the beetroot is soft. Leave it to cool completely, then peel and slice the beetroot. For the horseradish sauce, mix the horseradish with creme fraiche and add salt and black pepper to taste. 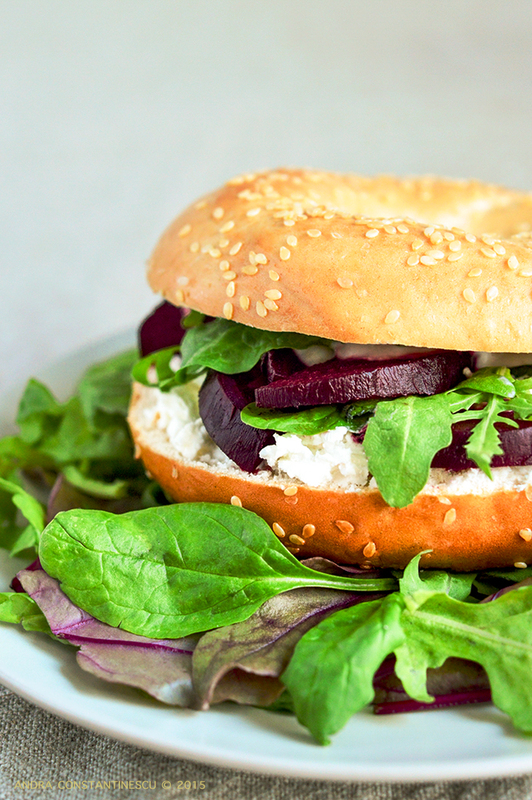 Fill the bagels with crumbled goats cheese, sliced beetroot, salad leaves and horseradish sauce and serve them on a bed of mixed salad leaves.